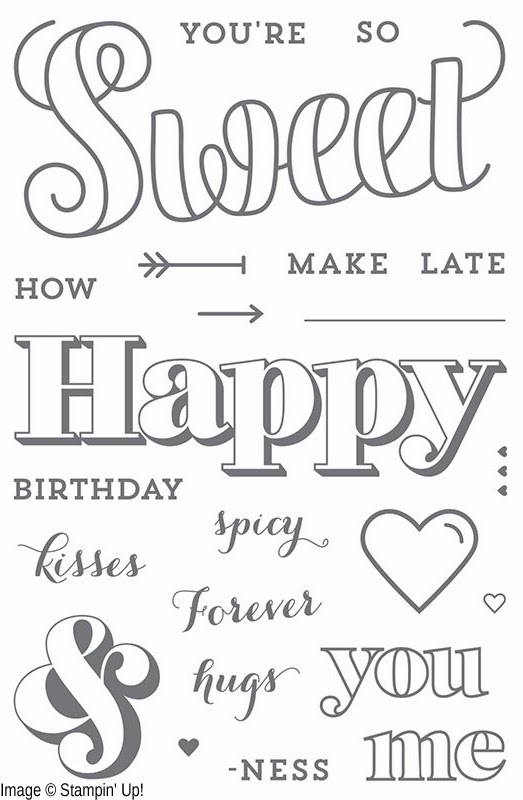 These fun samples were stamped on Whisper White card stock, which you can buy already cut and scored to card size as Whisper White Cut & Ready Card Bases. Be sure to stamp outline images with the StazOn Jet Black Ink Pad, to avoid smearing. Instead of colored markers, you may want to purchase all the following ink pads, and use Blender Pens to color your images with ink from the ink pad. That way you get more bang for your buck! To recreate these cards in the colors shown, you'll want to get the Bermuda Bay Classic Stampin' Pad, Calypso Coral Classic Stampin' Pad, Crisp Cantaloupe Classic Stampin' Pad, Pink Pirouette Classic Stampin' Pad, Pistachio Pudding Classic Stampin' Pad, and the Smoky Slate Classic Stampin' Pad. Countless Sayings 1 Photopolymer Stamp Set includes 17 separate stamps, and Clear Blocks blocks A, B, E, G, H, and I are recommended. 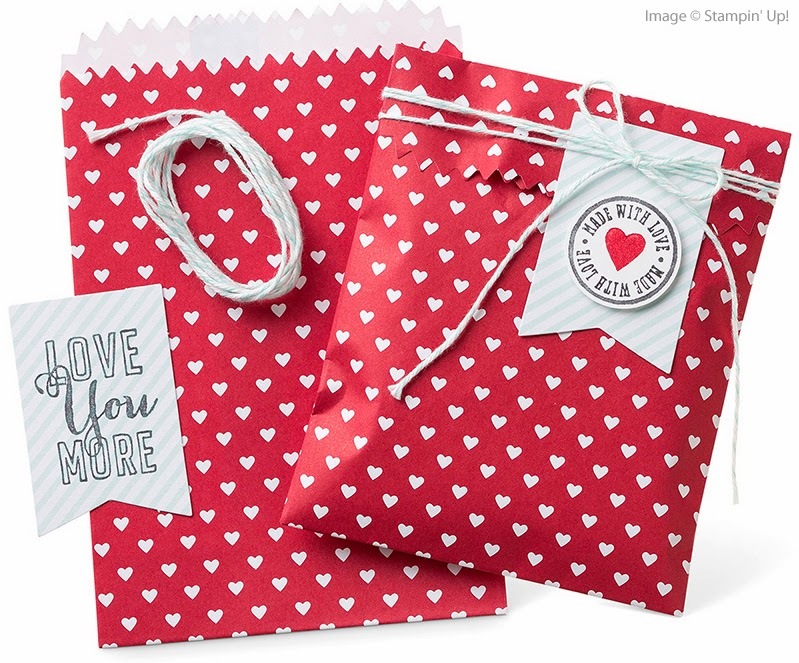 This set is obviously great for Valentine's Day, but also for any other love notes, and even for scrapbooking baby pages. There are many saying combinations you can pick out from this set, making it quite versatile. 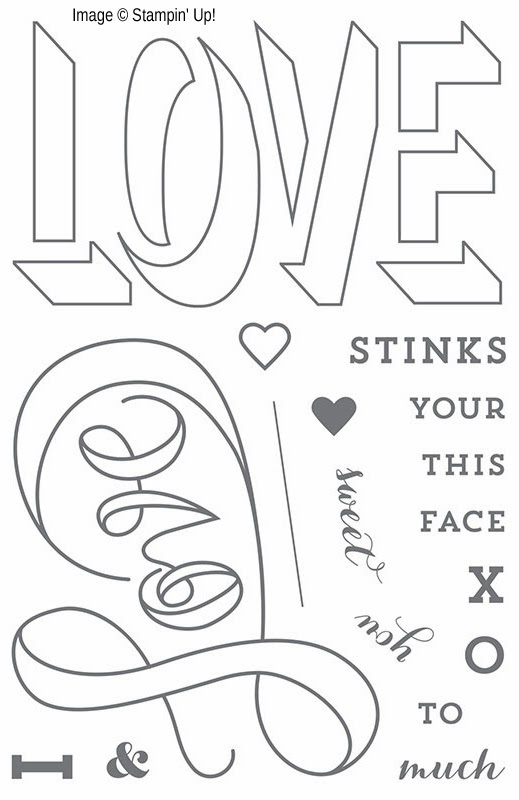 You could stamp "Love Your Face", "Love You This Much", On the other hand, you could stamp "Love Stinks", for a sympathetic breakup card, or, "Your Face Stinks", when you get dumped! Just kidding on that last one, but it is kinda funny. Countless Sayings 2 Photopolymer Stamp Set includes 23 separate stamps, and Clear Blocks A, B, E, G, H, and I are also recommended for use with this set. 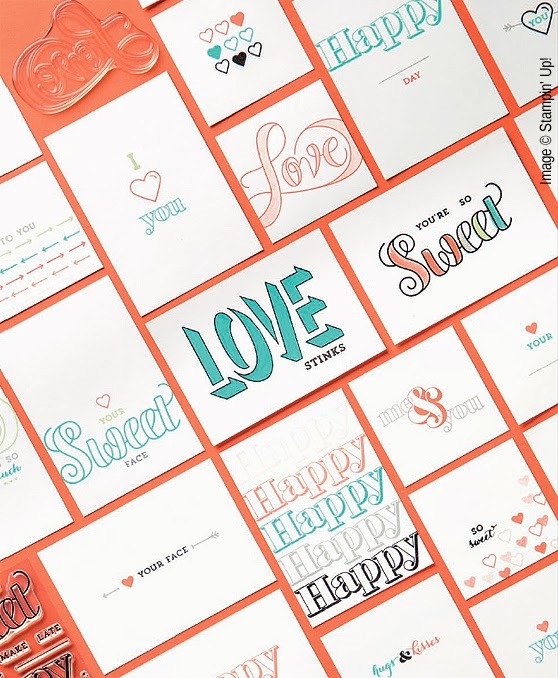 (Don't forget, you can get the Clear Block Bundle with ALL sizes, at 15% OFF every day) This set is also great for Valentine's Day, and is maybe a little more huggy-kissy, and couple-centered, but it also has some greetings you can use for birthdays, or even wedding pages. Honestly, I would just go ahead and grab both these stamp sets, and then your options are expanded. While you're at it, check out my personal favorite photopolymer stamp set (well, my favorite of the ones still available), Another Thank You Photopolymer Stamp Set. You'll want to make sure you have Clear Blocks A, B, C, D, and F for this set. 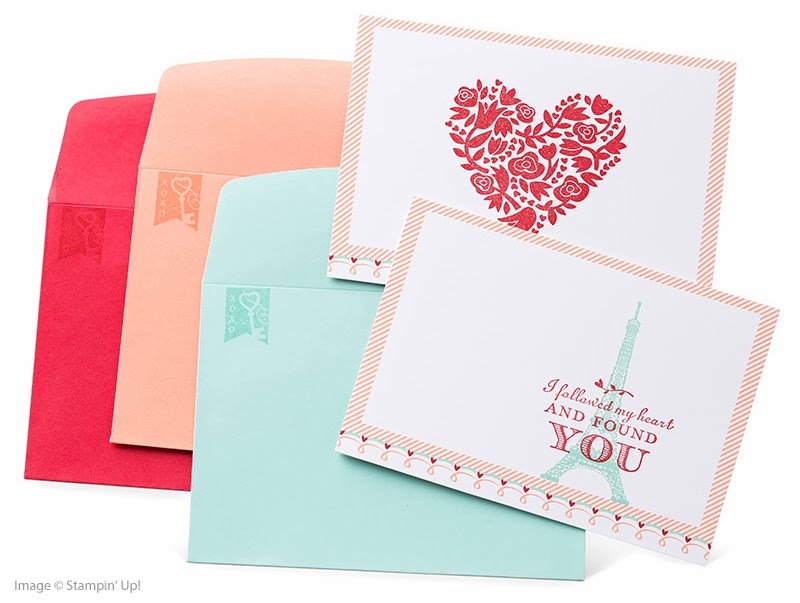 With all three of these stamp sets, you could make cards and scrapbook pages for weddings, babies, birthdays...and you could stamp a set of Thank You cards as gifts for these occasions! You can find these products in my ONLINE STORE--if the product does not have a direct link, just search my store for the product name listed in bold. If you have any problems finding anything, please email me and I am happy to give you direct links, or enter your order for you on my entry screen. I am also happy to help you brainstorm other creative ideas and color combinations for your projects. 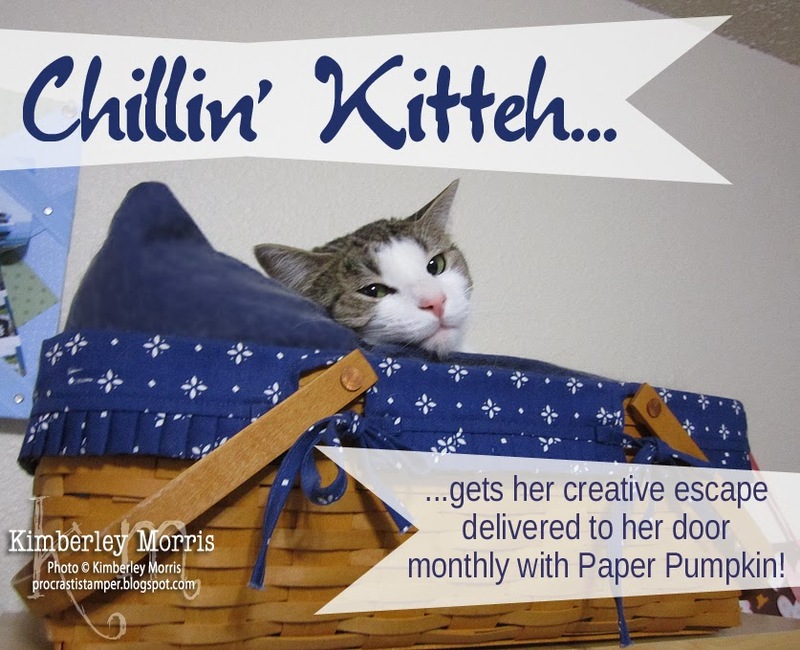 The ordering/modification deadline for Paper Pumpkin this month has arrived! Subscribe to get a crafting kit delivered right to your doorstep every month (or just click that link to get more info). There is no obligation, you can skip a month or cancel at any time. Current Paper Pumpkin Subscribers: Remember to sign in and manage your account HERE by 11:59pm MT on December 10th, if you would like the changes to take place this month. You can Skip, Change the Quantity of kits you receive, update your payment and/or shipping information, or Cancel. Get UP TO 80% OFF in the Clearance Rack, with newly added and newly marked down items, starting TODAY! There are tons of fun products in there, like fabric, buttons, dies, embossing folders, ribbon, trim, papers, and there are even DISCOUNTED STAMPS!!! All items are WHILE SUPPLIES LAST so get over there NOW and grab what you want. There are some great holiday items in there, and if you grab them from my ONLINE STORE immediately, you should receive them with just enough time to make some cards or gifts with them for this year! Featuring Season of Style Designer Series Paper Stack, Soft Suede ink, Gumball Green card stock, and Crushed Curry card stock. Featuring Winter Frost Designer Series Paper Stack, Island Indigo ink & card stock, and Pool Party card stock. These cards are designed around Divine Mini Milk Chocolate Pieces, and the Divine Mini Dark Chocolate Pieces are the same size, so you can use them interchangeably. On the Gift Box Cards, each chocolate has a tab to pull it out. On the Christmas Tree Card, you can access both sides of the top chocolate, so no need for pull tabs there. However, there are pull tabs on each of the lower chocolates. You can find the chocolates at DivineChocolate.com or at SERRV.org. Currently, they are available only in 150 piece boxes. Don't worry, you will use/eat ALL of them in no time! I will be showing you more treat holders using them for the holidays, and even into Valentine's Day. Both color combos of the Gift Bow Card use a Stampin' Sponge to sponge around the layered edges of the Artisan Label Punch Bow (click for tutorial). Both color combos of the Christmas Tree Card use the Merry Minis Punch Pack, to punch out the star for the top of the tree. [Merry Minis Punch Pack is on sale through 11:50pm MT on December 9th!] For the card bases, you can use either card stock from a package, or our new Cut & Ready Card Bases--the colors for my card bases are Crumb Cake and Smoky Slate. Let's say you didn't want to make the Gift Box Card...maybe you only want to make the Christmas Tree Card. That's totally cool, each set of cards purposefully uses different patterns from its featured paper stack. Each stack has 48 sheets in it, so, in the case of the Red/Green tree, you could make 24 trees using the Season of Style DSP Stack's chevron pattern paper, and make another 24 of them using the dotted paper (shown on the Gift Box Card). Similarly, you can make 24 of the Blue/Gray trees as shown, and make another 24 using the Winter Frost DSP Stack's 6-point star pattern. You can easily tuck these cards in standard envelopes, but I think you will have to pay extra postage for the thickness if you mail them, so I would go ahead and put them in a padded envelope for better protection. I've had to redo the tutorial for the cards since I've redesigned them to more efficiently use the patterned papers, but hope to have that up this weekend--thanks for your patience! With all the holiday hoopla going on, December birthdays are sometimes forgotten. Believe me, my birthday is on the 24th, and half the time I forget it myself! This is a card we made at a Workshop last month, featuring the Sketched Birthday stamp set (available in wood-mount, clear-mount, and Spanish). I think it's cute enough for a girl, but without any frills that would preclude it being given to a boy. The Off the Grid stamp (wood-mount only) was stamped in Encore Gold Metallic Ink in the background for a subtle but festive sheen. This card was difficult to photograph, and accurately capture the play between the colors. In real life, it's very striking--or at least I think so! As always, I could have used a bajillion different supplies, but I tried to keep it simple. For instance, I knew I wanted to color the main image, so I tried to keep the markers mostly from the 2013-2015 In Color Marker Assortment. I did add the Daffodil Delight marker so I could color the cake, but that one is available individually, and I also used it to ink up the stamp on the Daffodil Delight card stock circle at the top right. If you look closely at the candle, you'll see I dabbed a tiny bit of Crisp Canteloupe marker in the flame, too. You could make the card instantly girly by subbing in Strawberry Slush everywhere I used Coastal Cabana. Also, the sayings in this stamp set can be cut out with the Bitty Banners Framelits, but I just hand trimmed mine with Paper Snips. 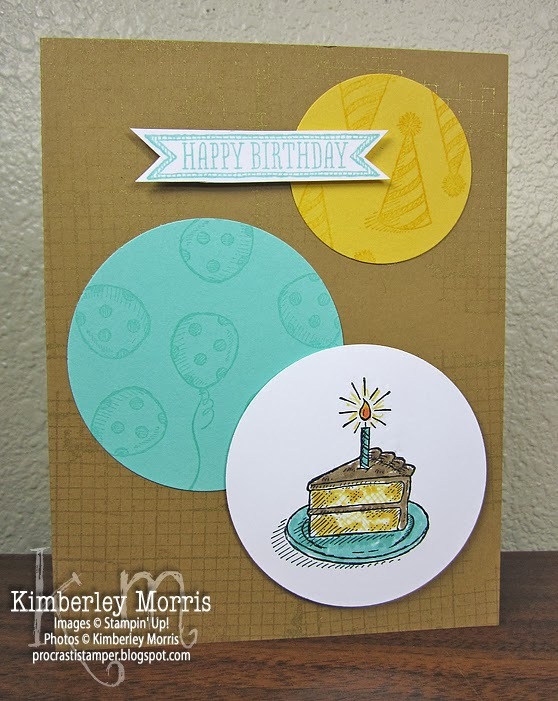 Stampin' Supplies: Sketched Birthday stamp set and Off the Grid stamp (see links in post), 2013-2015 In Color Marker Assortment 131260, Baked Brown Sugar card stock 131296, Coastal Cabana card stock 131297, Daffodil Delight card stock 119683, Daffodil Delight marker 119677, Whisper White card stock 100730, StazOn Black ink pad 101406, Gold Encore Metallic ink pad 132141, 2-1/2" Circle Punch 120906, 1-3/4" Circle Punch 119850, Paper Snips 103579, Stampin' Trimmer 126889 (to cut & score your card base). 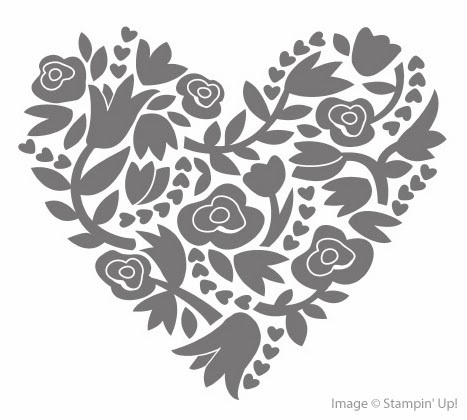 From Christmas to Valentine's Day to St. Patrick's Day...with Stampin' Up! Stamp-a-Tag Kit: ink and twine in Cherry Cobbler and Old Olive...the "to" stamp even has a little heart shape in it--perfect for Valentine's treat tags! Save the Old Olive striped twine for St. Patrick's Day projects. * Old Olive Simply Styled Embellishments: Tuck these away to give out on St. Patrick's Day, to make your friends instantly un-pinchable! Attach to a lapel, button placket, pocket, shoelace, etc. Merry Little Christmas Simply Created Card Kit: Another cute Valentine, with just a tad bit of imagination, but if you cut away the lower (unseen) part from the red/white polka dot envelope liner, into skinny strips, you can cover each red/green stripe on the other patterned paper strip and make Valentine cards! Use a Valentine's stamp set (maybe choose from our Whole Lot of Love products) on the white banner piece of the card, and save the green/white striped Baker's Twine for St. Patrick's Day treats. Winter Frost Designer Series Paper Stack: each paper has a neutral design you can use (Smoky Slate/Coastal Cabana geometric pattern, Pool Party hexagon background), which makes a GREAT background for Valentine cards with a more masculine look--think Smoky Slate or Coastal Cabana card stock hearts. 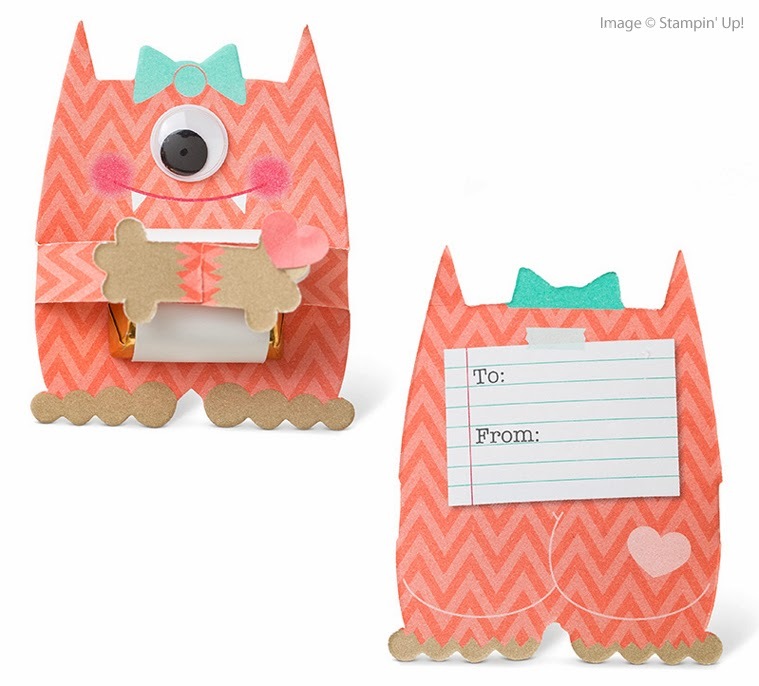 Or, pair with Melon Mambo or Strawberry Slush card stock hearts for a feminine look. This same idea applies to specially wrapped holiday candies, too. Try to grab those chocolates with the solid color red, green, and silver (or gold) wrappers, with neutral patterns like dots and stripes, instead of purchasing those with Christmas patterns or images on them. If you are making treat holders for the holidays, ensure the treats are removable without damage to the project or the candies. 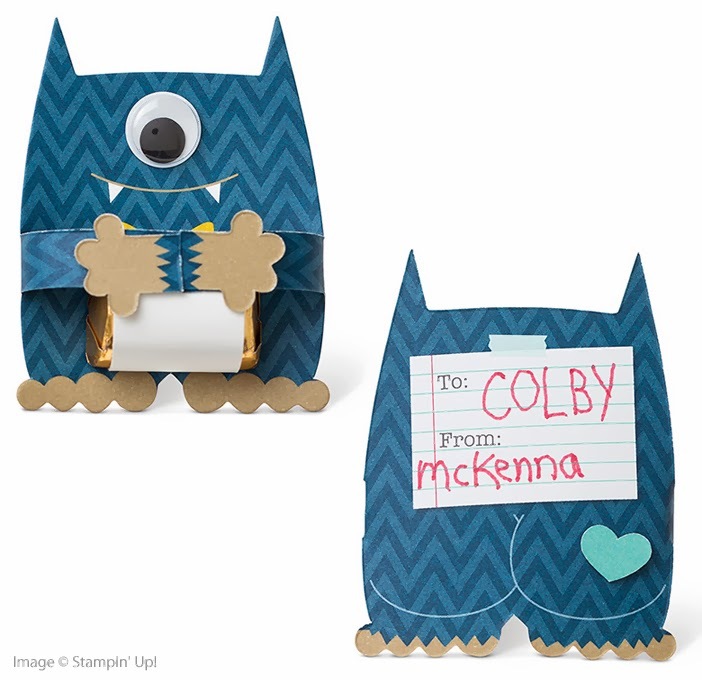 In other words, make treat holders that do not require you to permanently glue down the candies, such as an envelope into which you tuck the treat, or a box with a refastenable or removable device for opening. That way, you can take the candies out from projects you didn't end up gifting, and separate the candies into the colors you want to use for Valentine's Day and St. Patrick's Day. (Store them in air-tight containers to keep them fresh.) Need some project options? Just email me or leave a comment, and I'll send some ideas your way!!! Check out everything else that's available in my ONLINE STORE. Tell Me More About Your Stampin' Up! Gift Certificates! 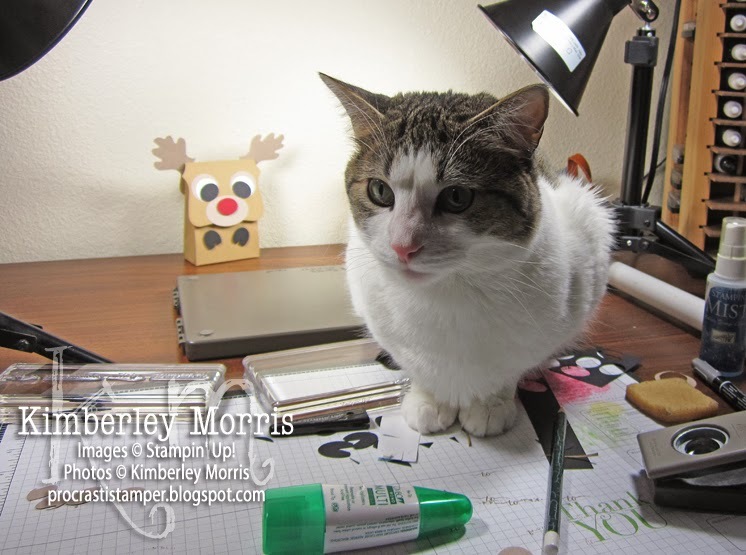 Yes, yes, I know...you don't even have your Christmas cards made yet, and you don't even want to *think* about Valentine's Day! But we crafters have to plan ahead, so I just want to plant a seed at the back of your mind, by sharing the Whole Lot of Love products which are available for order from December 1st, 2013 through January 27th, 2014 (or while supplies last!!!). Click any image below to see it larger. Did you catch that last little note in the top paragraph? I put it in red and italics, so I hope you did! This applies mostly to the pre-printed items, but as the end of the promotion approaches, it is feasible that even the exclusive stamp sets will not be reproduced. PLEASE do not wait til the last minute to grab these products if you want them! In fact, a Stampin' Up! Gift Certificate* would be awesome to give or receive, to scoop up some of these babies before they are gone! One reason I like to plant seeds for Valentine's Day before the holidays, is to bring up the fact that you can plan some of your crafting supply purchases to carry over into the new year. Huh? What is she talking about? Stay tuned for my next blog post where I will feature some projects and products with multi-occasion qualities! In honor of Cyber Monday, on Monday, December 2nd Get 30% OFF these items for ONE DAY ONLY! 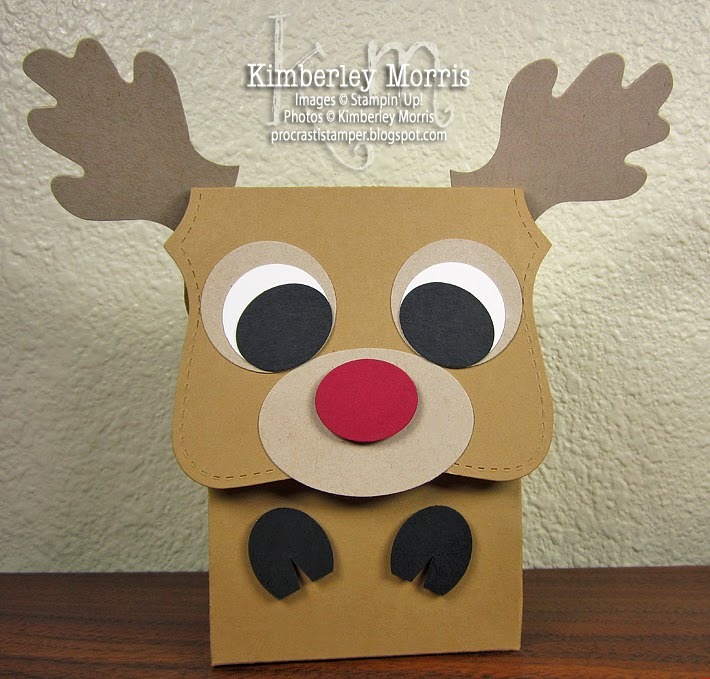 If you can get only one item, I highly recommend the Envelope Liners Framelit Dies. They are not just for lining envelopes--they make super cute gift card holders, treat holders, and you can even make an awesome mini bag with "handles"!!! Seriously, the list of ideas grows pretty much daily. December 2nd is also the LAST DAY of Stampin' Up! 's 2013 Holiday Sale. Get Up to 50% OFF a large selection of sale items. Click the link below to view them all in my ONLINE STORE. 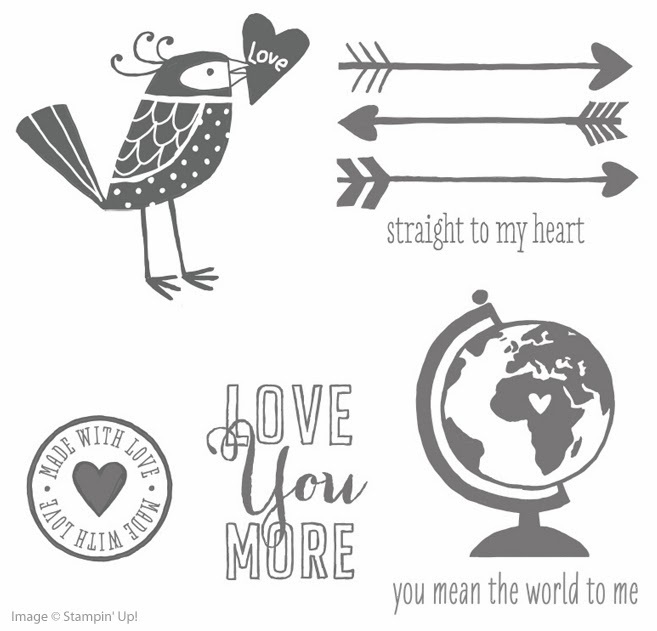 You can also shop Stampin' Up! 's Weekly Deals, specially discounted product offerings such as the Pop & Place Holiday Gift Tag & Stamp Bundles, the Festive Flurry Ornaments Kit, and other already amazingly low priced and discounted Kits & Bundles, as well as Stampin' Up! 's Clearance Rack for even greater savings. 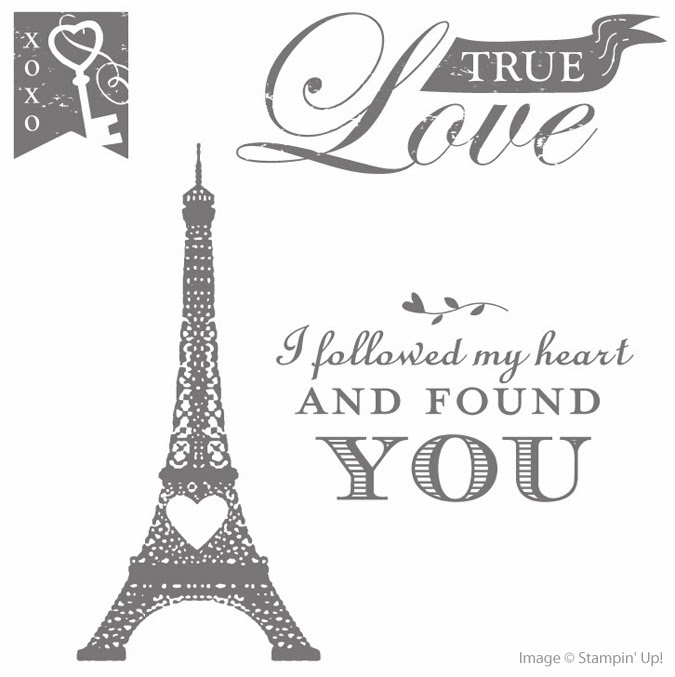 While you're at it, be sure to check out Stampin' Up! 's Online Only Products--these are products you'll only see pictured online, they aren't listed in any catalog. 11:50pm MT on Monday, December 2nd.